Please accept our sincerest thanks and gratitude for your continued support and immense generosity toward the staff and students of Oliver Wendell Holmes. Here at Holmes, we strive to provide the highest level of academic and social emotional support to our students, and due to your generosity, we are able to offer our students a multitude of experiences and resources that they would otherwise not be able to partake in. As a valued community partner, your support of our school is invaluable and appreciated beyond words. Today, more than ever, the emphasis on attaining academic proficiency is a focus of not only the school board, but the state and nation as a whole. Through your numerous donations, we are able to provide our staff and students with the critical resources that we so desperately need, to ensure success. Again, thank you, and your team, for your unwavering support. 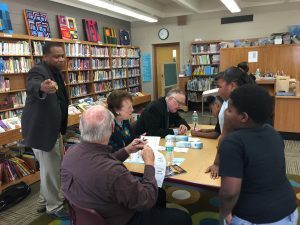 Each year RCM distributes books to Holmes students, funds a Nefertari Dance Program, provides behavioral incentive and attendance awards, and funding for school yard beautification.